← It’s Equal Pay Day! Final Out in Reel 2012 Films! It’s hard to believe that LGBTQI Awareness Month is almost over! We hope to see you this Thursday, April 26th at 7pm in Hoyt Hall Auditorium for the final screening in our Out in Reel Film Series! A panel discussion with transgender youth and young adults will follow the screening of two short award-winning documentaries, The Family Journey: Raising Gender Nonconforming Youth and No Dumb Questions. You can find directions to Hoyt Hall by visiting the SBAI website. Parking at the University is free at 7pm. A special thank you to the Warner LGBTQ and Allies SIG for organizing the panel discussion. The Family Journey charts the emotional and intellectual transformations parents and siblings must make in order to successfully nurture their gender nonconforming family members. In frank, vulnerable interviews, families from all over the country speak about the power of love and acceptance to help their unusual children thrive. They also come to realize that loving a gender nonconforming child, in the face of ignorance—and sometimes—hostility, has turned them into more compassionate human beings. 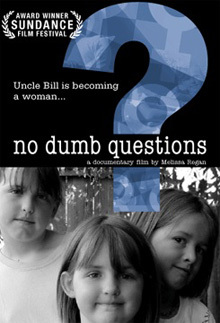 No Dumb Questions is a lighthearted and poignant documentary that profiles three sisters, ages 6, 9 and 11, struggling to understand why and how their Uncle Bill is becoming a woman. With just weeks until Bill’s first visit as Barbara, the sisters navigate the complex territories of anatomy, sexuality, personality, gender and fashion. Their reactions are funny, touching, and distinctly different. This film offers a fresh perspective on a complex situation from a family that insists there are no dumb questions. Prior to the film on Thursday, Pride Alliance at the University of Rochester will be hosting a Networking Social for LGBTQ and ally faculty, staff, and students. The event takes place on April 26th from 5pm to 7:30pm at the Staybridge Suites Hotel (1000 Genesee Street, Rochester) in the Grand Rapids Room. Light refreshments, beer, wine, and soft drinks will be served. RSVPs are requested. Email stanley.byrd@rochester.edu if you would like to attend. This entry was posted in SBAI Events and tagged #film, #filmseries, #gender, #LGBTQI, #LGBTQIawarenessmonth, #warner. Bookmark the permalink.